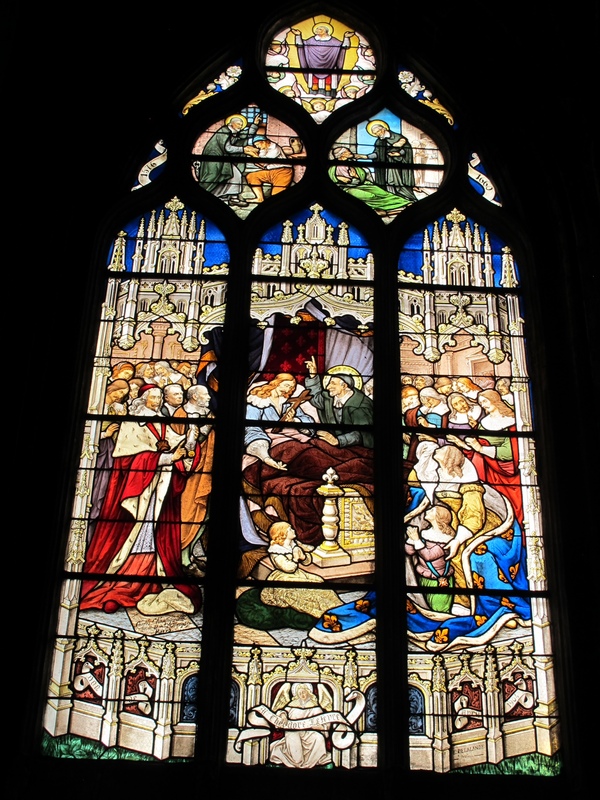 A Monk’s Chronicle: 25 December MMXVII — A Happy and Joyful Christmas! A Happy and Joyful Christmas! In chapter 6 of his Rule for Monks Saint Benedict writes that “there are times when good words are to be left unsaid out of esteem for silence.” Given the abundance of noise that accompanies the Christmas season, it dawned on me that the sparing use of words might be the wisest counsel on this wonderful day. So I hope it will suffice to wish you a peaceful Christmas season. May the Lord be with you as he speaks gently yet persistently through the noise and din of the season! +It’s never a good idea to limit the act of thanksgiving to one day out of the year, and this last week offered a reminder to be grateful for all the airport delays that I’ve not experienced during the past year. While I and my fellow passengers complained about some minor airport difficulties on our way home last week, our Brother Paul would have gladly traded places. On the way to a speaking engagement in Nassau, The Bahamas, he had a connecting flight in Atlanta, on the night when the lights went out in that part of Georgia. That night he slept on the floor, with thousands of other stranded passengers. +On December 21st, after evening prayer, I took part in a gathering of monks from our floor in the monastery. Our custom is that the residents of each floor decorate their own tree, and it’s an opportunity to share some time in that interlude between the end of the semester and the liturgies of Christmas. +On December 23rd I acceded to the inevitable and retrieved my winter coat from storage. It’s been relatively benign in Minnesota — until now. Not so today, Christmas Day, when the forecast includes some heroic temperatures. My lightweight coat is simply not up to dealing with that. +On December 24th we celebrated evening prayer in the Great Hall, the former Abbey church, while the last of the Christmas preparations were being made in the church. 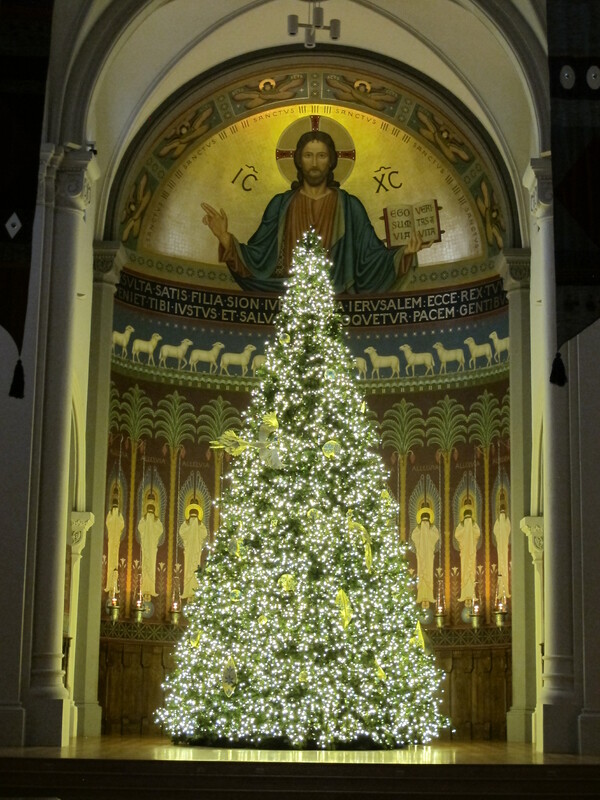 At 9:30 pm we gathered once again for a concert of sacred music, followed by the Christmas Eve Mass at 10:00 pm. The music was exceptional, and it included the participation of The Saint John’s Boys Choir. Joining us were some 1,100 friends and neighbors who had driven short and long distances to celebrate with us. +The photo at the top of the post is a work by Brother Frank Kacmarcik, a now-deceased oblate of Saint John’s Abbey. “I’ve never done that before.” That’s an excuse that I’ve used countless times, and I wish I had a dollar for each time I’ve relied on it to get me out of a jam. Even richer would I be if I had a dollar for when I’ve been part of a group that collectively invoked it. God’s invitation to Mary was certainly unique, but never for a minute should we conclude that God has left us off the hook. In fact, on any given day God puts to us all sorts of invitations. A few are huge, and most are inconsequential. Yet, after all these years and all sorts of missed opportunities, I’m still surprised by my own hesitation to dive right in. Whenever that happens I remind myself that at core I’m risk-averse. When God or anybody else asks me to step out of my comfort zone my immediate reaction is caution. I hesitate to try new things. I delay and mentally dig in my heels. But when I do swing into action, I always wonder why I hadn’t done it sooner. 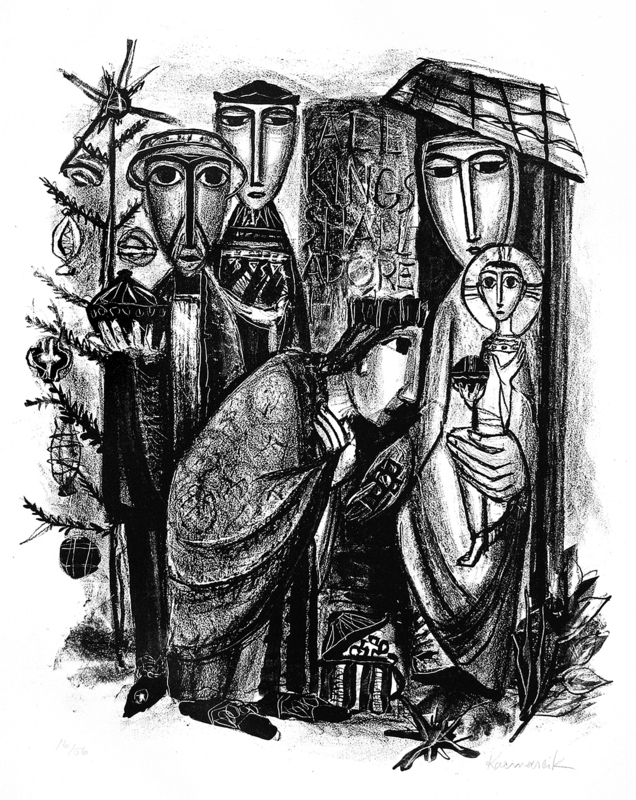 A key message of Advent is the story of someone who decided not to let fear paralyze her. So it was that Mary threw in her lot with God. Despite everything, she said “yes,” and life was never the same for her. Sadly I, who am better-schooled and have advantages that Mary never had, fear to take the leap when God beckons. Perhaps I’m just too good at thinking up great excuses, and sometimes I’ve even imagined that I have too much to lose. But Mary teaches me and all of us a good lesson. She was one of the first to act upon an idea that Jesus preached over and over: those who lose their lives for his sake gain everything. Could it be that was one of the things that Mary taught Jesus as he grew in age and wisdom? In response to God’s invitation Mary threw all her caution out the window and said “yes” to God. And that might shape the sort of advice she would give to us today. She’d likely say that her “yes” made all the difference in the world for her. Perhaps our “yes” might do exactly the same for us. +On December 12th I presided at the Abbey Mass on the feast of Our Lady of Guadalupe. +On December 13th I fought the snow as I drove to the airport to fly to Fort Myers, FL. There was no snow in Florida, but there was traffic, and lots of it. On the first day I witnessed two accidents, one of which looked horrible. Lest anyone conclude from today’s post that “caution” is a bad idea, I quickly affirm its value on the roads and highways in the run-up to Christmas. 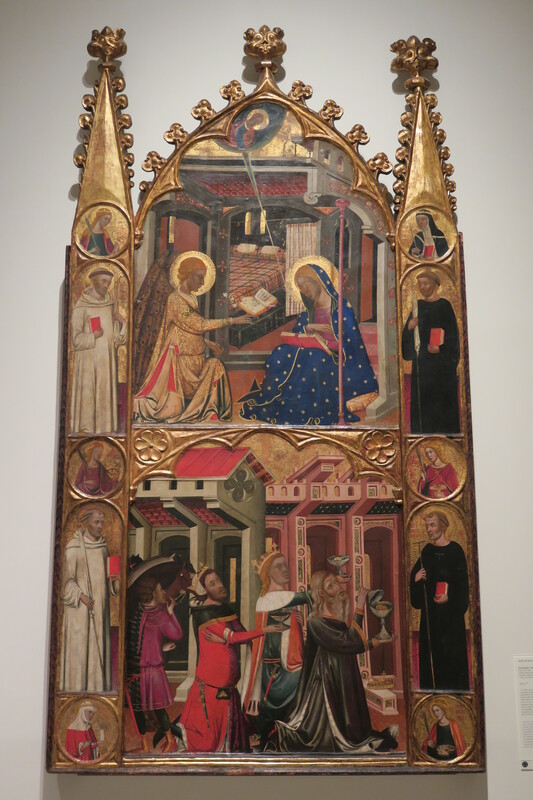 +In today’s post I have images from two altar panels, housed in the Museum of Catalan Art in Barcelona. 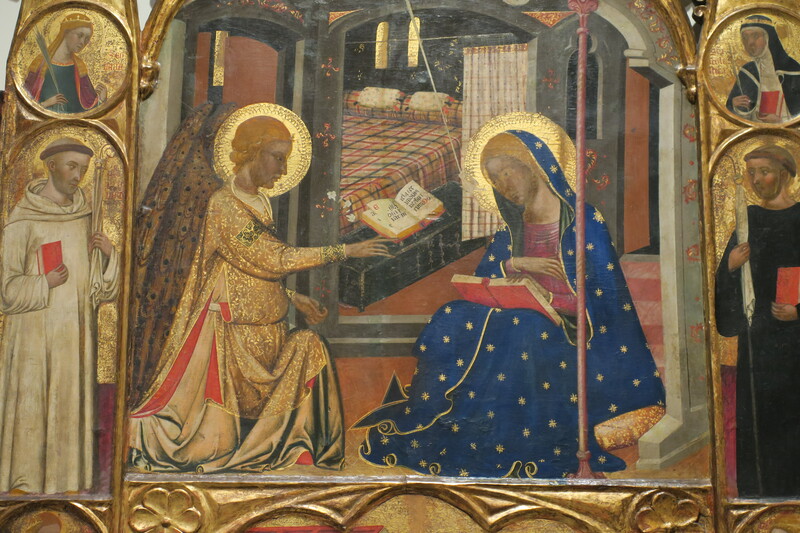 Both are of the Annunciation, and the first is a ca. 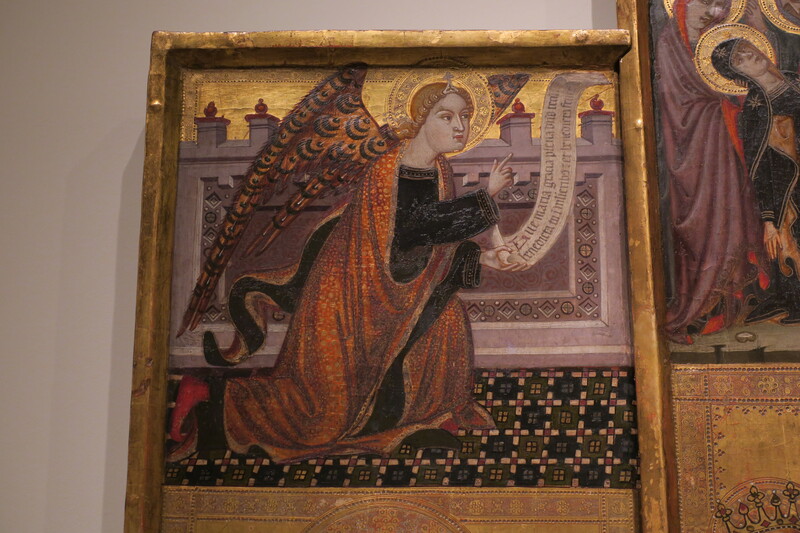 1350 panel made for the Church of Saint Vincent in Cardona.. 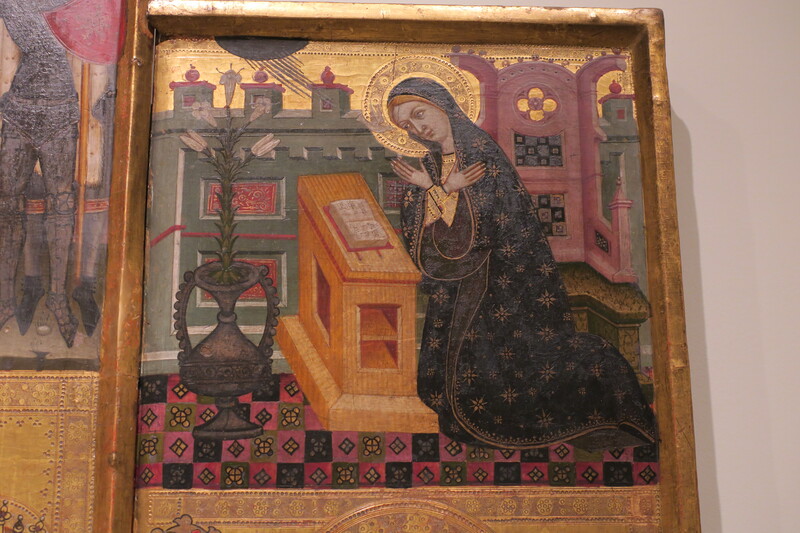 The second is a 14th-century image from a church in Valencia. A Monk’s Chronicle: 11 December MMXVII — How Will You Season the Season? How Will You Season the Season? For years I’ve campaigned for the privilege of experiencing art first-hand. That includes a visit to a gallery, listening to music performed by real live people rather than by a machine, or wandering through an architectural masterpiece. Somehow it all seems to be the right thing to do, particularly if there’s a chance to thank the creative talents that have made it come to pass. Last week I had the chance to experience Handel’s Messiah, which I’d not done in years. I use the verb experience deliberately, because you can’t just sit there like a bump on a log, as if it were Muzak in an elevator. Handel’s Messiah sweeps you off your feet, and so it was as my ears feasted on the voices and the instruments. But it was a visual treat as well. There, right in front of me, 120 singers performed with dignity and with a power that was alternately unleashed and restrained. Along with them were the musicians, who seemed to cradle their tanned wooden instruments as if they were new-borns. It was stunning on so many levels, and I was not the only one who had goose-bumps. I know so, because several total strangers came up to me and volunteered the same experience. As beautiful as it was, there was one other thing that struck me. Amazingly, for the space of two hours, 140 wonderfully creative people surrendered their inalienable right to do their own thing and decided to act as one. For that brief interlude no one glanced at email or cell phones. No one strayed off onto some musical tangent in order to improve on Handel’s score. Instead, in a grand display of self-discipline, everybody sang or played the notes assigned to them. Nor did they drift around the stage when there were no notes assigned to them. Instead, they performed as a community. Together they achieved something that they could never have accomplished on their own. For one brief moment they banished the rugged individualism that diminishes our world, and they offered to us a glimpse into a heaven we’d not noticed before. Advent is not a time for rugged individualism, nor is it a season in which we wander off into our own personal reveries. Advent is not the season in which to ignore other people, and that includes the people whose creativity enriches our lives and those whose ill health isolates them from full participation in the joys of life. Advent instead is a time when all of us should step up and take an active part in the fullness of life that is spread before us. Most obviously, Jesus is our best teacher for this important lesson. He was not born as the son of Mary for the sole purpose of doing his own thing. He had a mission; he had a purpose; and he came so that we might have life and have it in abundance. For those of us who intend to follow in the steps of Jesus, then, it’s paramount that we embrace life and live it graciously and with intensity. Obviously we can’t attend concerts or go to museums during every waking hour, but it’s important that we season our lives with such experiences. Obviously we can’t help the sick and the poor whenever and wherever we encounter them; but it’s important to recognize them as fellow pilgrims. And just as obviously, it’s incredibly unhealthy to spend all our time just doing our own thing, as if no one else mattered. Oddly enough, when no one else matters, neither do we. Living this sort of full and balanced life is not always easy, but living as if I alone mattered is an illness for which there is a cure. The cure involves thanking people for their creativity. It involves reaching out in moments when we can make a tangible difference. It involves using our hands to do the work of Jesus on a daily basis. And if that’s too much to do year-round, then perhaps it’s a good exercise for Advent. So what’s a person to do with Advent? My advice to myself is to season the season with art — in all its forms. Season the season with service. Season the season with quiet time to consider God’s gifts to me and my neighbor. If I do all that, I figure that Christmas might very well come a little early this year. +No doubt the highlight of the last week was a three-day trip to Ontario that I took with one of my colleagues from Saint John’s. On December 7th we flew to Toronto, and on the evening of the 8th I delivered a lecture on The Saint John’s Bible at Saint Jerome University in Waterloo, Ontario. The next evening we attended the production of Handel’s Messiah, performed by the Grand Philharmonic Choir and the Kitchener-Waterloo Symphony. That concert took place in Kitchener, and preceding the concert I gave a presentation on The Saint John’s Bible, to what turned out to be a standing-room-only crowd. The performance of Messiah was wonderful, though my colleague had the misfortune of being seated next to a woman who decided to sing along with the choir. As a result he did not enjoy the performance quite as much as did I. +I actually do have one good friend in Waterloo, and my visit there gave me the chance to meet up with him. Roman is a member of the Order of Malta in Obedience and is now president of the Order of Malta in Canada. 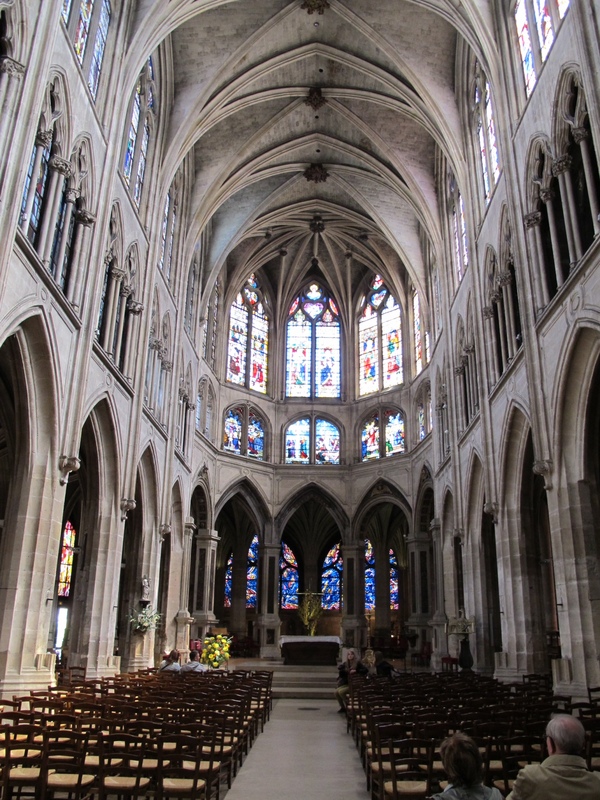 We’ve met many times over the years in Lourdes and more recently at an annual retreat that takes place in Malvern, PA.
+The photos in today’s post all come from the Church of Saint Séverin in Paris. 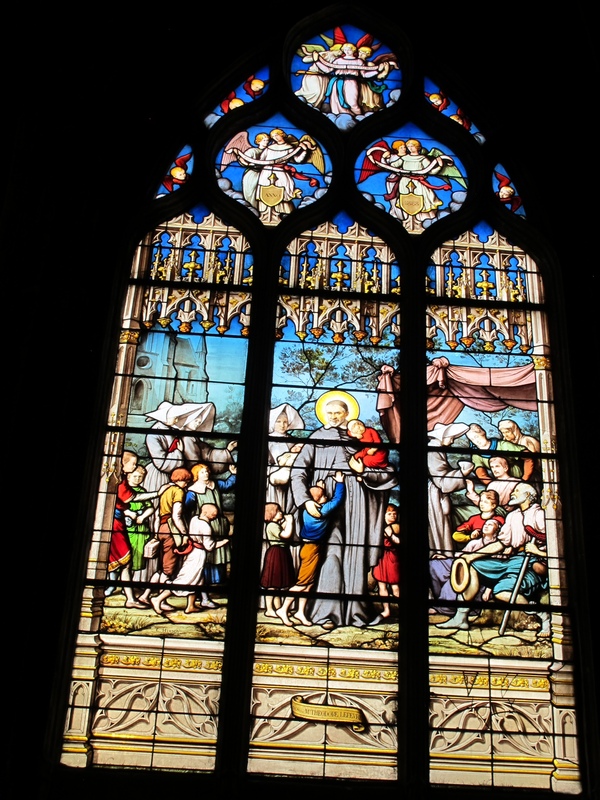 The first stained glass window shows Saint Martin of Tour sharing his cloak with a poor begger, while the others show Saint Vincent de Paul as he made the rounds among the poor of Paris. I’ve never been one of those monks who love to bolt out of church as soon as is decently possible. Like most of my confreres, I’m happy enough to make my exit at a leisurely pace. All the same, I do appreciate the caution that St. Benedict gave about lingering too long in the oratory when community prayer is over. On this he and I are of one mind: enough is enough, even for monks. That latter point helps explain my general lack of enthusiasm when a feast day brings in its tow a second reading at morning prayer. At that hour I’m either groggy or rehearsing in my mind the day’s to-do list. So one reading is more than enough, and a second is a gratuity that brings no thrill. There are exceptions, of course, and last week’s feast of St. Andrew was one of them. That feast brought a second reading, and to my surprise it grabbed my attention as second readings seldom do. It came from the pen of John Henry Cardinal Newman, and it pointed out something that was so obvious that I was embarrassed never to have considered it before. Cardinal Newman opened with the point that Andrew and Peter were perhaps the first disciples whom Jesus called. That I already knew. I also knew that Andrew had shown his commitment to Jesus by bringing others to meet him. What I’d not considered, however, was the reward that came to Andrew for being among the first and the most unwavering in his loyalty. To paraphrase Newman, for all of his effort Andrew seems to have gotten the 1st-century equivalent of diddly-squat. For perspective, consider Andrew’s brother Peter. When the chips were down Peter denied Jesus three times, and he was impetuous in his behavior. Yet he got it all. He got the celebrity; he got the authority; he got the keys to the kingdom of heaven and the power to bind and loose. And what did Andrew get? Obscurity. Cardinal Newman wonders about the justice in this, and so do I. As I listened to Newman’s passage, I thought of the promise Jesus made that the first shall be last and the last first. That was certainly true for Andrew, and it left me wondering whether Andrew ever resented his brother Peter. Anybody could see that Andrew was more promising executive material. And yet, like Jacob’s brother Esau, he got passed over in the succession planning. Then it dawned on me. Andrew, at least in my opinion, should be the patron saint of all siblings who have to live in the shadow of a more charismatic brother or sister. Andrew is the model for all those who toil without fail and with sterling reliability, day in and day out, largely unnoticed. 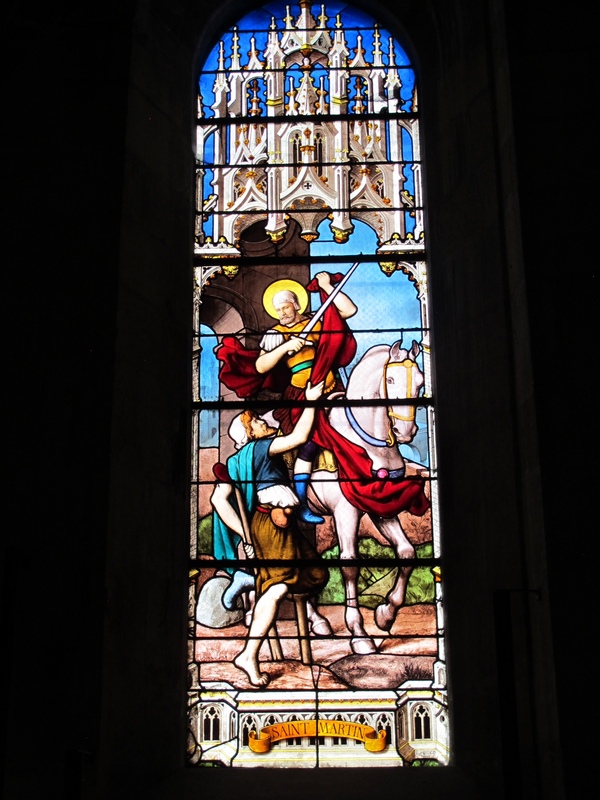 The Church should name him the patron saint for all who feel overworked and underappreciated. That’s more than I normally get out of an average second reading on a feast day, and for that I’m grateful to Andrew. I’m grateful for the way Andrew lived his life, and I’m grateful that he gave some good material for Cardinal Newman to work with. And thanks to Cardinal Newman, I came away with a deeper appreciation for Andrew and the kind of person he represents. At this remove, then, do I think that Andrew harbors any resentment that the largest church in the world is named for his brother? Absolutely not. Does he envy his brother for his celebrity? I seriously doubt it. Does he regret his brother’s impetuous and bumbling character? Perhaps he found it slightly amusing. Foremost for Andrew, however, was his relationship with Jesus, and he was eager to share his Lord with others. That’s what he would recommend to us if he were sitting next to us today. Still, we’re left with one nagging question. Was life unfair to Andrew? From the perspective of celebrity, Andrew clearly got the short end of the stick. But on another level his reward was more than ample. He was among the first to know Jesus. His friendship with the Lord never wobbled for a minute. That said, he got the reward but not the fanfare. To my way of thinking, that’s a patron saint whose time has come. +During the month of November we remember all those who have specifically asked us to pray for their deceased friends and family members. People send in to the Abbot’s office their requests, which are then gathered in a basket at the entrance to church. As we monks file in we take one of those slips with us and return it when prayer is done. For whatever reason, I have found this custom to be wonderful. It makes tangible our effort to be mindful of the needs of others. +On December 2nd we monks had our monthly day of reflection. In addition to the Abbot’s conference at 10 am, we went about our lives in silence from morning until the completion of dinner. +On Sunday evening, December 3rd, Bishop Donald Kettler of St. Cloud presided and preached at the student Mass. That was followed by refreshments and the opportunity to meet and visit with the bishop. Bishop Kettler is an alumnus of Saint John’s University twice over, and he regularly visits campus. We are always delighted by his presence. +The photos in today’s post come from a variety of sources. 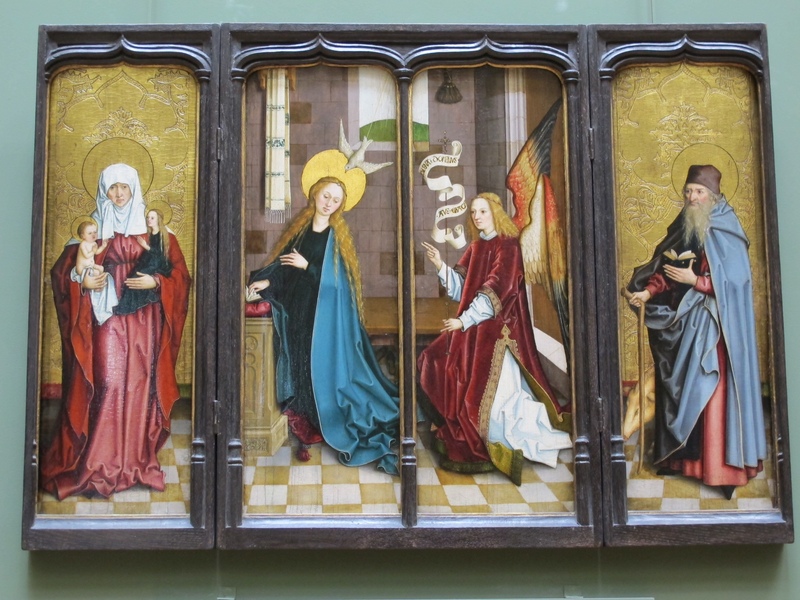 At the top is an altar panel of The Annunciation by Bartolomaus Zeitblom, ca. 1500, housed in the Louvre in Paris. 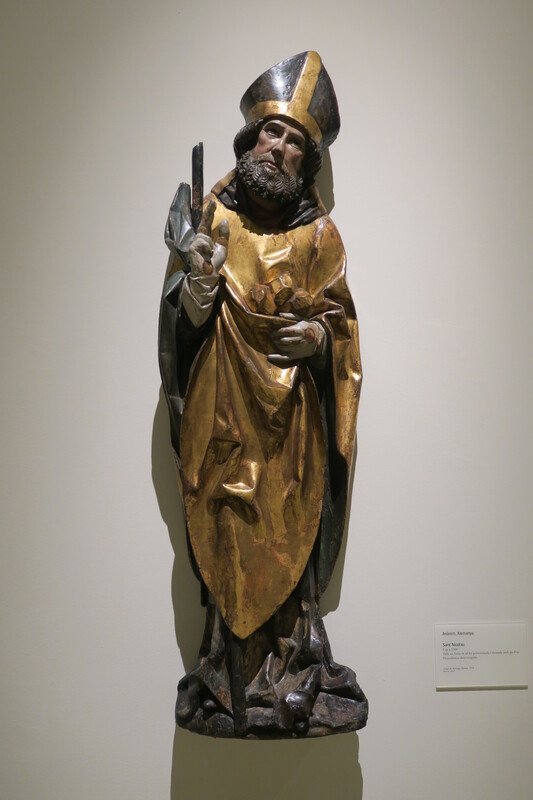 Below that is a carving of St. Peter by Roderick d’Osona, made in Valencia, ca. 1500, and housed in the Museum of Catalan Art in Barcelona. 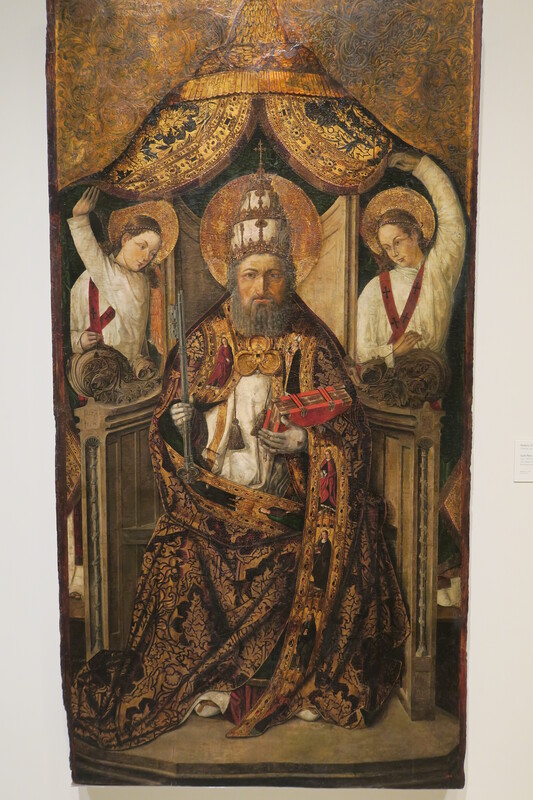 Next is yet another saint who gets a lot of press at this time of year: Saint Nickolas, by an anonymous artist, ca. 1500. 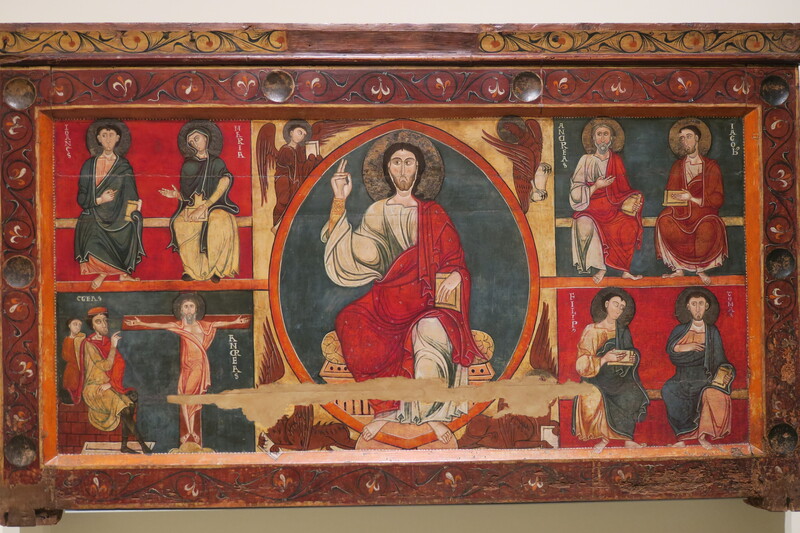 It too is in the Museum of Catalan Art, as is the altar frontal from the Church of Saint Andrew, ca. 1200. 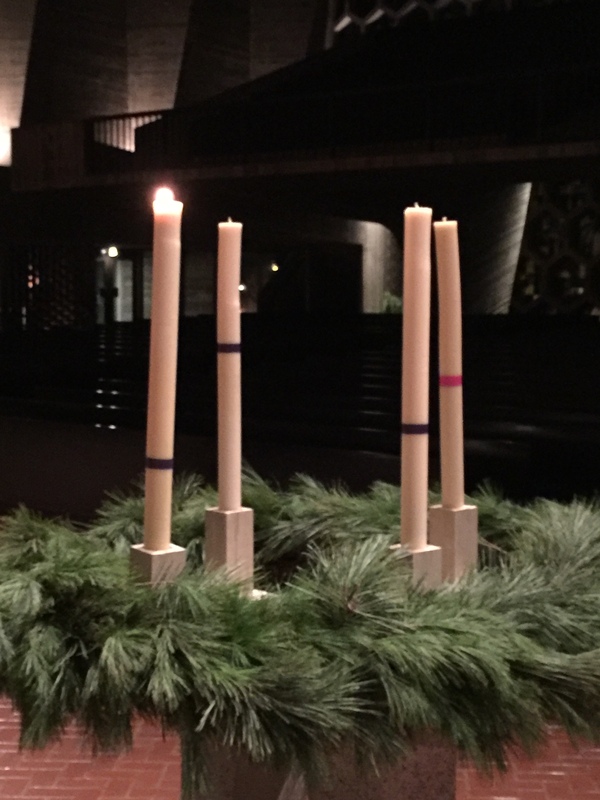 +On Saturday evening, December 2nd, Abbot John lit the first candle on the two Advent wreaths that we have, one in the reflectory and the second in the church. The photo above is from the church, and Fr. Lew and Novice Jacob labored over that wreath until every last twig was in place.